On Sunday 29 at 11 am, the Logos International School Agape Choir will be performing at Women’s International Group Christmas Fair at the InterContinental Hotel. Plenty more family Christmas activities going on from 10 am – entry $3, children over three $1. Also on Sunday 29, at 7 pm, $3 entry provides you with two hours with a life model at Drink and Draw at Show Box. BYO materials. The Phnom Penh Writers Workshop is a regular gathering of Phnom Penh writers who are interested in discussion and critique of their works in progress. The next workshop will be held Sunday 29– if you would like to be involved, please contact Carly Nugent (cnfrizzle [at] gmail.com). Just launched, a special appeal by Java Arts, raising money for artists hit by last month’s fire at the rear of the café. “The work of eight artists: Anida Yoeu Ali, Chath PierSath, Genevieve Marot, Neak Sophal, Nicolas C Grey, Oeur Sokuntevy, Qudy Xu-Min and William Graef are valued at $20,000 and accounts for about 10% of the available works on the art market in Cambodia.” The Java Arts Fire Relief Fund is being run through Indiegogo. At the same time, Amrita Performing Arts looks to the future with Next Steps, and asks for assistance in the establishment of a residency for young Khmer choreographers. Check out the Indiegogo pitch for this exciting new project. The Cambodian festival season continues next week with the Cambodian International Film Festival in Phnom Penh from Friday 4 December through to Thursday 10, crossing over with the Angkor Photo Festival Saturday 5 December though to Saturday 12. Sunday 29 at 11 am, the Logos International School Agape Choir will be performing at Women’s International Group Christmas Fair at the InterContinental Hotel. Sunday 29 at 7 pm, $3 entry provides you with two hours with a life model at Drink and Draw at Show Box. BYO materials. Sunday 29, the Phnom Penh Writers Workshop – if you would like to be involved, please contact Carly Nugent (cnfrizzle [at] gmail.com). Meta House hosts the opening of War Remnants of the Khmer Rouge, a photographic exhibition by Maureen Lambray. 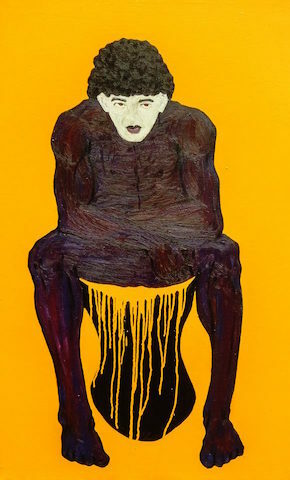 Samai Distillery and on-line art gallery laäsai presents Wat Tu (Object), by Thai contemporary artist Jitti Jumnianwai. At the French Institute, a photographic exhibition featuring the works of students of Studio Images, mixing portraits and architectural subjects. At Bophana Center, a photographic exhibition opening for A Century Artist, a book celebrating the life and work of legendary Royal dancer Neak Krou Em Theay. The show will run until December 15. Tonight Tuesday 17 at 6 pm, Java Café Independence Monument presents In Someone Else’s Shoes, a conversation circle with emerging choreographers Nam Narim, Phon Sopheap and Soy Chanborey, moderated by Amrita Performing Arts Artistic Director Chey Chankethya, discussing their work and their process. This event is in Khmer and English. Also tonight Tuesday 17 at 6 pm, Meta House hosts the opening of War Remnants of the Khmer Rouge, a photographic exhibition by Maureen Lambray focusing on victims of land mines in Cambodia. This will be followed at 7 pm by a screening of David A. Feingold’s Silent Sentinels, Coward’s War, and then at 8 pm a discussion on peace and reconciliation in Cambodia led by Sok-Kheang Ly and Suyheang Kry from the Anlong Veng Peace Center. On Friday 20 at 6 pm, Java Café’s youth open mic for music and poetry (and anything else!) Slam Jam returns after a break. Come along and bring the talented young people in your life to share their skills. On Sunday 22, Khmer Architecture Tours hosts a two hour public walking tour of the Front du Bassac, starting at Chaktomuk Conference Hall and ending at the White Building. $8 per person. Reservations required, email contact [at] ka-tours.org. Starts at 8.30 am. On Sunday 22 at 6.30 pm Cambodian Living Arts presents an evening of electronic music jamming with traditional instruments, featuring Krom Monster and CLA students. The next Phnom Penh Writers Workshop will be held on 29 November – please email cnfrizzle [at] gmail.com for submissions or additional information about this on-going and thriving writing event. One of the many events at the Kampot Writers and Readers Festival was the launch of a book of poetry by Myley Rattle, The Manimal Diaries. Copies are now available in Phnom Penh for $3. Please contact Myley Rattle if you would like a copy. Tuesday 17, 6 pm at Java Café Independence Monument, In Someone Else’s Shoes, a conversation circle with emerging choreographers Nam Narim, Phon Sopheap and Soy Chanborey, moderated by Amrita Performing Arts Artistic Director Chey Chankethya. Tuesday 17, 6 pm at Meta House hosts the opening of War Remnants of the Khmer Rouge, a photographic exhibition by Maureen Lambray; at 7 pm by a screening of David A. Feingold’s Silent Sentinels, Coward’s War; then at 8 pm a discussion on peace and reconciliation in Cambodia. Thursday 19 from 7 pm at Samai Distillery, on-line art gallery laäsai presents Wat Tu (Object), by Thai contemporary artist Jitti Jumnianwai. Friday 20 at 6 pm, Java Café’s youth open mic for music and poetry (and anything else!) Slam Jam returns. Sunday 22, Khmer Architecture Tours hosts a two hour public walking tour of the Front du Bassac, starting at Chaktomuk Conference Hall and ending at the White Building. Reservations required, email contact [at] ka-tours.org. Sunday 22 at 6.30 pm Cambodian Living Arts presents an evening of electronic music jamming with traditional instruments, featuring Krom Monster and CLA students. Meta House hosts Solitudes, by Nget Chanpenh, a 22 year old artist from Romcheik 5 Studios in Battambang. The annual Northbridge School art exhibition, this year entitlted Beyond Pattern, officially opened at the InterContinental Hotel last week, exploring cultural patterns. A selection of works will be on display till November 26. There is much to celebrate in the arts in Cambodia, and this week particular mention must go to the efforts to put on the inaugural Kampot Writers and Readers Festival over the weekend. The momentum generated by this literary event is already being felt for writers of all stripes, and we look forward to the next. A round of applause from Kumnooh for the event organisers, the volunteers, the participants and the audiences. Tonight, Tuesday 10 from 6 pm, Meta House hosts the opening of Solitudes, by Nget Chanpenh, a 22 year old artist from Romcheik 5 Studios in Battambang. The 17 pieces collect together moments of life’s various solitudes. At the same time, 6 pm tonight, Tuesday 10, Java Café Independence Monument presents an artist talk with Hong Kong based illustrator Tanya Bennett and multi-disciplinary artist Marc Standing, who have come to Cambodia to hold a four day arts workshop for children at HAGAR Cambodia Creative Arts Project, under the auspices of the Sovereign Art Foundation. English language event with Khmer interpretation. At the French Institute tonight, Tuesday 10, from 6.30 pm, Yoshiyuki Yamana, architect and professor at the University of Science of Tokyo, will speak about the works of architect Le Corbusier in Asia, including buildings in India and Japan. The lecture is part of the series of events Living together, dedicated to the topics of urbanisme, architecture and housing. French language event with interpretation into English and Khmer. Commencing on Thursday 12, the 12th International Music Festival Phnom Penh presents a series of concerts at the InterContinental Hotel and Meta House. The theme this year is The European Dream of Progress and Enlightenment, the period of 1700 to 1900, and works of the heavyweights such as Beethoven, Mozart, Mendelssohn and Liszt feature alongside lesser known composers, performed by ensembles and soloists from the region and beyond. Seating is limited, and advanced purchase is encouraged. The full programme is available here. The opening concert, at the InterContinental Hotel on Thursday 12 features the Pantun Trio from Kuala Lumpur, Malaysia. At the French Institute on Thursday 12 from 6.30, the opening of a photographic exhibition featuring the works of students of Studio Images, mixing portraits and architectural subjects. On Friday 13 and Saturday 14, Amrita Performing Arts presents the Contemporary Dance Platform, the biannual showcase of new works created by emerging Cambodian choreographers, interspersed with talks and discussions about contemporary dance, at the Department of Performing Arts. Tickets ($5/$2.50) are available at the Amrita office (128G9 Sothearos Blvd), Java Café and at the door. To book tickets, you can also contact boxoffice [ at ] amritaperformingarts.org or 077-945015. 7 pm start. On Friday 13 at Bophana Center, a book launch and photographic exhibition opening for A Century Artist, celebrating the life and work of legendary Royal dancer Neak Krou Em Theay. German photographer Arjay Stevens accompanied Em Theay with his camera for twenty years. For a look at the dancing, here is a video from the National Museum event last weekend. The show will run until December 15. On Saturday 14 at Develop Boeng Kak and Simone Art are holding the Happy Day event with live music, street art, workshops and DJs. Starts at 4 pm – continues through to 2 am. On Sunday 15, Showbox hosts their regular Drink and Draw session from 7 pm. $3 for two hours with a life model – byo drawing materials. Phnom Penh resident, ambient music composer and WASH collaboration member Warren Daly’s new EP, The Stones Are Awake, is now available from Bandcamp, iTunes, Google Play, Amazon, Spotify and other digital stores. The work includes excerpts from longer compositions written for the multi-faceted live performance The Stones Are Awake performed at Meta House in July and August of this year, and features text by Scott Bywater read by Bernadette Vincent. A video clip is now available too. Tuesday 10 from 6 pm, Meta House hosts the opening of Solitudes, by Nget Chanpenh, a 22 year old artist from Romcheik 5 Studios in Battambang. Tuesday 10 from 6 pm, Java Café Independence Monument presents an artist talk with Hong Kong based illustrator Tanya Bennett and multi-disciplinary artist Marc Standing. Tuesday 10 from 6.30 pm at the French Institute, Yoshiyuki Yamana, architect and professor at the University of Science of Tokyo, will speak about the works of architect Le Corbusier in Asia, including buildings in India and Japan. Thursday 12 to Monday 16, the 12th International Music Festival Phnom Penh presents a series of concerts at the InterContinental Hotel and Meta House. The full programme is available here. Thursday 12 from 6.30 pm at the French Institute, the opening of a photographic exhibition featuring the works of students of Studio Images, mixing portraits and architectural subjects. Friday 13 and Saturday 14 at 7 pm at the Department of Performing Arts, Amrita Performing Arts presents the Contemporary Dance Platform, the biannual showcase of new works created by emerging Cambodian choreographers. Tickets ($5/$2.50) are available at the Amrita office (128G9 Sothearos Blvd), Java Café and at the door. Friday 13 at Bophana Center, a book launch and photographic exhibition opening for A Century Artist, celebrating the life and work of legendary Royal dancer Neak Krou Em Theay. The show will run until December 15. Sunday 15 from 7 pm, Showbox hosts their regular Drink and Draw session. The French Institute presents Connaître Le Corbusier, as part of their Living Together series of events focusing on the city, architecture and housing. At Bophana Centre, a children’s drawing exhibition, Wildlife and Forests in the far North-East of Cambodia.